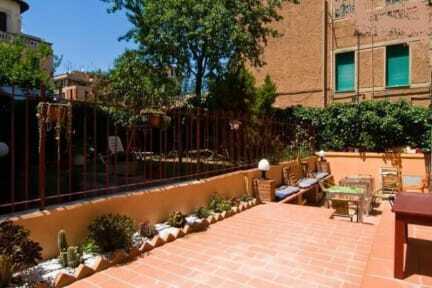 Monica e Alice B&B is located on the ground floor of an elegant small building which has recently been renovated. It consists a double room, bathrooms and a nice size kitchen. There is a special kitchen access to a terrace yard which makes it a great location for outdoors eating, the weather in Rome stays nice and comfortably warm for most part of the year! The room is neatly and carefully furnished and is made unique with a '70s style. The house is very cozy and comfortable at the same time. Check in from 12.00 to 20.30. Please call the reception before arrive.